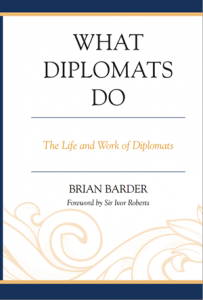 Stop Press, May 2016: What Diplomats Do has now been published in paperback (and is still available in hardback and as an e-book). All three versions, including the new paperback, can be bought with a generous discount, which is now available until the last day of 2017 (not expiring at the end of September 2016 as originally announced) : please see section below headed ‘Order What Diplomats Do’. What do diplomats actually do? That is what this text seeks to answer by describing the various stages of a typical diplomat’s career. The book follows a fictional diplomat from his application to join the national diplomatic service through different postings at home and overseas, culminating with his appointment as ambassador and retirement. The book is not a memoir or autobiography, but each chapter contains case studies, based on the author’s thirty year experience as a diplomat, Ambassador, and High Commissioner. These illustrate such key issues as the role of the diplomat during emergency crises or working as part of a national delegation to a permanent conference such as the United Nations. Rigorously academic in its coverage yet extremely lively and engaging, this unique work will serve as a primer to any students and junior diplomats wishing to grasp what the practice of diplomacy is actually like. Sir Brian Barder, KCMG, had a varied career in the British Diplomatic Service, serving in Moscow, Canberra and New York, as ambassador to Ethiopia, the Republic of Bénin, and Poland, and as high commissioner to Nigeria and Australia. A former founding member with judicial status of the Special Immigration Appeals Commission, a former hospital governor and member of the ESU Speech and Debate Committee, he writes a popular blog and contributes regularly to LabourList. He is an honorary visiting fellow at the University of Leicester Department of Politics and International Relations. 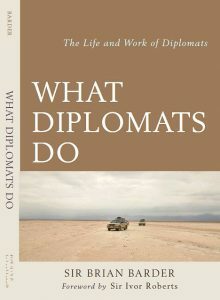 More information about What Diplomats Do is on the publishers’ website. The book was published on 21 July 2014 as a hardback and e-book and in May 2016 also in paperback, by Rowman & Littlefield. 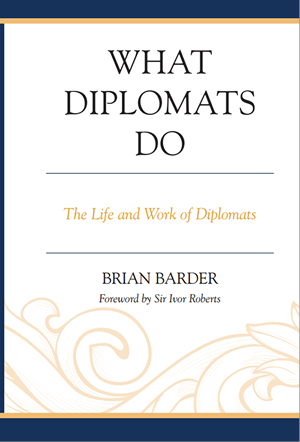 Click here to read some pre-publication and recent reviews of What Diplomats Do. Click Publisher’s order form For UK and other UK£ sterling orders only. Paperback, hardback and e-book. Click Publisher’s order form For United States and Canadian US$ orders only. Paperback, hardback and e-book. and from other good booksellers.